Hotel Revival lives up to its name. When the former hostelry in this 89-year-old building on Mount Vernon Place closed in 2016, Joie de Vivre, a San Francisco-based company specializing in boutique hotels, came to the rescue and undertook an extensive renovation project that truly revived the property. You need only step into the trendy lobby to appreciate the extent of the imaginative transformation. Catching a meal in one of Hotel Revival’s two restaurants reinforces that point. The 14th-floor Topside, serving vibrant food and drink amid fetching views of the Washington Monument, already looks like a longtime “in” place after only a month. The ground floor restaurant, Square Meal, is worth checking out, too. More intimate in scale and (going by our experience) quieter than Topside, this spot consists of two rooms, each with its own minimalist design evoking Scandinavian coolness. We opted for the space with upholstered booths and metal tables. There we explored a menu devised by executive chef Wilbur Cox, a native Baltimorean who brings to both Square Meal and Topside a flair for diverse flavors and textures, a knack for presentation. Our visit coincided with a substantial change in the fare at Square Meal. Gone were the meat and seafood entrees initially offered. Gone, too, were the prices that went with them. Instead of pushing $30, the highest item on the revised list was $21, the rest in the teens. The new menu has a spring-y emphasis, with many a vegetable woven into the picture. Excellent chilled English pea soup impressed with its blend of pickled ramp and mushrooms in a creamy base. Can’t get much more seasonal than that. Sure you can. The spring green salad looked and tasted as if the leafy greens had just been harvested from a fertile garden behind the hotel. The addition of crisp snap peas and asparagus, along with prosciutto and soft boiled egg, all in harmony with a nuanced champagne vinaigrette, completed this straightforward charmer. A starter of baby carrots, artfully arrayed on the plate, had a little too much going on, what with mascarpone, cayenne honey and, of all things, carmelized white chocolate. It was hard to remember that carrots were even in this almost dessert-y mix. But everything clicked in a dish of crispy Brussels sprouts (has this vegetable ever had as much attention at restaurants as it gets these days?). The mingling of smoked grapes and walnuts added lovely layers of flavor, as did a maple vinaigrette. House-made pastas we tried included a rigatoni with a hearty, very palatable vegetable version of Bolognese sauce, and an even more engaging mustard green bucatini that, with peas, bacon and carbonara sauce, tasted at once rustic and urban. Up-market sandwiches fill out the menu. The oysters in the oyster “BLTA,” tucked inside a ciabatta roll, were fried too long, but the resulting dryness was offset by a creole mayo that went well with the bacon, lettuce, tomato and avocado. The croque madame — the egg-topped variation on the croque monsieur — proved delectably hearty. The ham, gruyere and bechamel meshed in fresh and flavorful fashion. Desserts revealed creativity in design and content. Roasted apple, for example, gained intriguing personality from the unexpected addition of olive oil and pistachio. Evoking a deconstructionist sculptural installation, blocks of white chocolate leaned against a lemon tart, with crumbly bits fanning out on one side, a mound of tea ice cream on the other. The flavors, including accents of ginger and sesame, didn’t entirely mesh, but the result was refreshing. In addition to up-market wines, there are 40 bottles covering all the bases and each priced at $40. The Tuscan red we sampled was more than adequate. The restaurant’s bar served up colorful cocktails, including a gimlet made with a peppery boutique gin from Nikka Coffey, a Japanese distillery best known for its whiskey. 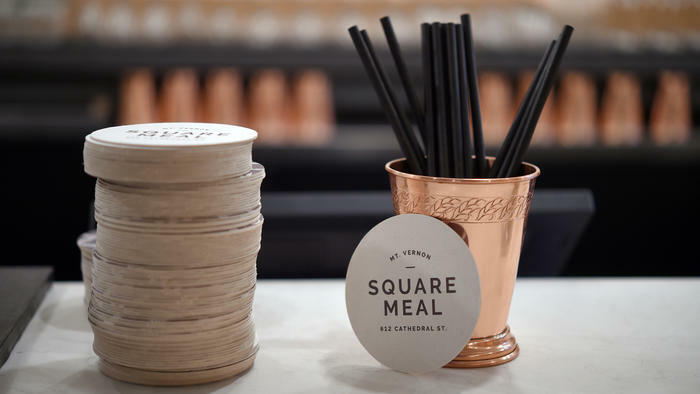 Square Meal has room to improve. For one thing, it would be nice to have proper bread for the table (we got a microwaved croissant and some Melba toast-like slices). And it would be nice to see a few substantial entrees back on the menu. Still, given the innovation already evident in the kitchen and the professionalism of the staff, this restaurant is likely to keep evolving and enticing. Ambience: Cooly stylish, the restaurant has a clubby, intimate vibe. Special needs: The facility is handicap accessible. The kitchen can accommodate special diets.